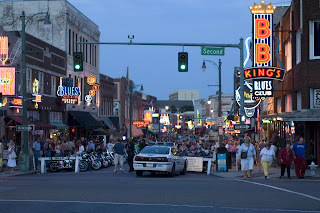 Beale Street, Memphis, TN "Home of the Blues". This image is from the summer of 2007 when I was in Memphis on a business trip. A friend and I decided it would be an interesting night to walk the streets of downtown Memphis and photograph the town. Little did I realize it appears to be home for as many panhandlers as tourist. At every street corner and at times in between, we encountered a panhandler attempting to sell something to us. A few even attempted to sell their "face" for a buck. Hey buddy, you can take my picture for a dollar. Unfortunately, the nuisance got the best of us and decided Beale Street was not the place for us to walk and take pictures. This image was taken hand-held using a 50mm f/1.8 on my D50 [before I purchased the D200]. It is an amazing camera/lens combination. Very small and able to take amazing shots in low light.